Call of Duty players are a notoriously aggressive lot, but backlash towards the latest Black Ops patch has officially crossed the line. 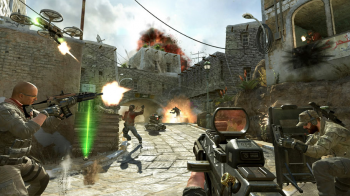 Treyarch design director David Vonderhaar recently took to Twitter to talk about the latest patch for Call of Duty: Black Ops 2, which modified three guns to be less powerful. While there was some rational discussion, Vonderhaar quickly found his Twitter feed flooded with hateful backlash including threats of violence towards him and his family. The anger began when he tweeted such inflammatory remarks as "The DSR fire time was 0.2 seconds. It's now 0.4 seconds. The rechamber time was 1.0 seconds. It's now 1.1 seconds." As the threats rolled in, Vonderhaar attempted to bring things into perspective for those bullying his account. Activision community manager Dan Amrich stepped in to defend Vonderhaar. "[Vonderhaar] often gets told he should die in a fire or kill himself or is a horrible person," Amrich writes. "If anybody thinks for a second that this is okay, it is not. But if the loudest voices in the Call of Duty 'community' act like an angry mob instead, guess how the entire world views Call of Duty? Now consider that these Internet Tough Guy rants and demands are not unique to COD, but exist everywhere, in many gaming communities. This is why the world often does not take gaming seriously; this is why gamers are assumed to be immature, whiny assholes. Because the immature, whiny assholes are louder." Amrich goes on to thank those who submitted reasonable feedback about the changes, and commends Vonderhaar for his patience. "If you enjoy your games, have a little respect for the people who make them - and stop threatening them with bodily harm every time they do their job."